ProPak Vietnam 2018 is Asia’s largest international trade exhibition dedicated to the processing and packaging of food, drinks and pharmaceuticals. The outstanding 3-day event held at the Saigon Exhibition and Convention Center took place from 20th – 22nd March 2018, and provided a platform for trade professionals to network, build connections, and stay up to date with industry news and events. This is another successful year of Russell Finex at ProPak Vietnam, with high quality enquiries and connections being made. 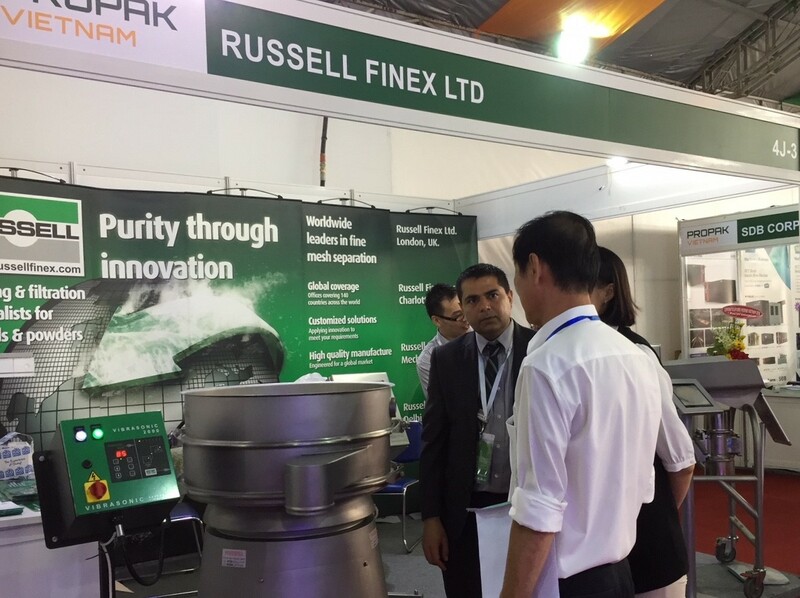 Russell Finex was located at booth 4J-3 with a range of sieving and filtration equipment for the food, drinks and pharmaceutical industries. The Finex Separator™ - This vibrating separator accurately grades both wet and dry materials up to five fractions in one operation. The Finex Separator™ provides advanced and accurate sieving capability for all products, with an increased capacity compared to conventional round separators. The Russell Vibrasonic® Deblinding System - This state-of-the-art ultrasonic sieve deblinding system has been designed to allow accurate separation of fine powders. The ultrasonic system can be retrofitted onto any sieve or separator for a reliable and consistent flow rate, free from blinding and blockage. The Russell Compact 3in1 Sieve™- This screening machine has been designed for processes that require hand fed ingredients through low-level bag emptying. The sieve is fitted with a bag tipping station and a dust hood which enables easy feed of material and provides operator safety. Self-Cleaning Russel Eco Filter® – These industrial filters remove any oversized particles or contamination from liquid products. The Russell Filter Management System™ has a unique self-cleaning design where there are no stoppages or downtime to change filters. Contact us to discover more about the innovative range of sieving and filtration solutions available to improve your food, drinks and pharmaceutical processing and packaging requirements.